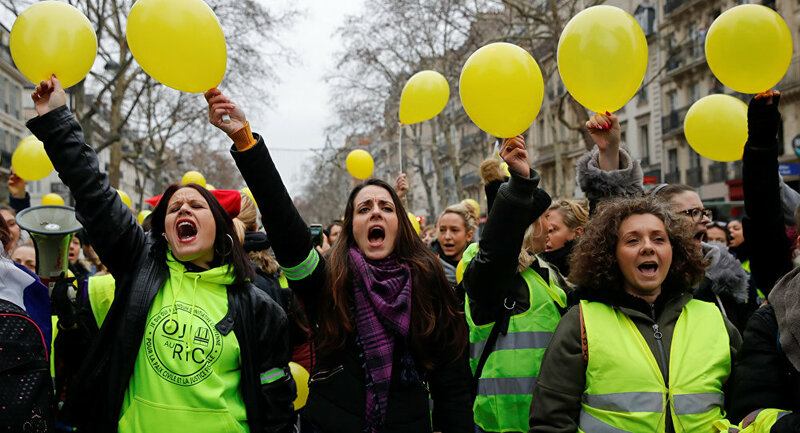 MOSCOW (Sputnik) - Hundreds of women spotting yellow vests and balloons gathered in downtown Paris on 6 January, a day after an anti-government march in the French capital. The predominantly female crowd descended in the morning on the Place de la Bastille, blocking traffic, before heading toward Place de la Republique, the France Info radio said. Protests against high living costs continued for the eighth consecutive weekend, with at least 50,000 people rallying nationwide. Some 3,500 protesters took to the streets of Paris on 5 January. — France Bleu Paris (@francebleuparis) 6 января 2019 г. Rallies against a planned hike in fuel taxes began in mid-November and have been called yellow vest protests — named after the obligatory attribute of French drivers. While the French government has scrapped its planned hike in diesel taxes, which is what initially sparked the protests, the "yellow vests" have evolved into a broader movement against government policies and rising living costs.